The continual quest of the AFC Heritage Trust to find and add information and artefacts to the Aberdeen Collection continues apace. Recently we managed to acquire the 1947 Scottish Cup Winners' medal awarded to Willie Waddell, one of our centre backs in the final. To say that it is a thing of beauty would not be over enthusiasm; the medals of that period are classy in design and have a good weight to them. Willie Waddell joined the Dons in May 1938 from Renfrew Juniors but his early progress was hampered by the outbreak of the Second World War. Willie played on for the Dons in the Wartime setup and was a member of the side that returned to action in national competition in 1945/46. In and out of the team in season 46/47, Waddell made a dramatic return to the First Team for the Scottish Cup Final when Willie Cooper had to miss out because of injury in the semi-final. History records that Aberdeen beat Hibernian 2-1 on 19th April 1947 with goals from Hamilton and Williams. After the presentation of the Cup and medals on the Hampden pitch there were huge celebrations at the ground and later back in Aberdeen. After the match Willie Waddell told local reporter Norman MacDonald that: "It's tough luck Willie Cooper missing his medal. He's worth one and if he doesn't get one then I intend to offer him mine." 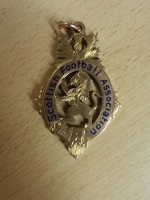 Fortunately, though, the Club was able to persuade the SFA to allow an extra medal to be struck for Cooper and Willie Waddell kept his as a treasured possession for many years. Now, 66 years on from the final, the medal has become a part of the Aberdeen Collection after the AFC Heritage Trust successfully bid for it at a football memorabilia auction in England. We will shortly have the medal framed along with the story of Willie Waddell and put it on show in a place of honour in the boardroom at Pittodrie for all to see. Special items like this medal could not be added to the Aberdeen Collection without the continuing backing of our fellow Dons' fans and this is a great example of what we can achieve with your support.